As technology improves and becomes more affordable, it would seem that services involving those technologies should do the same. Unfortunately, in the business world, it doesn't always work that way. But Robin Scott Enterprises, a local video production company at 6296 Quince Road, is aiming to change all that by marrying new technology with new ideas - and by throwing out some old ones. "The old days of brick-and-mortar studios are over," said Scott, who is from Memphis. "They're still around, but their days are certainly numbered." Scott's business is attempting to change the way Memphis thinks about video production. And Scott knows his subject well. 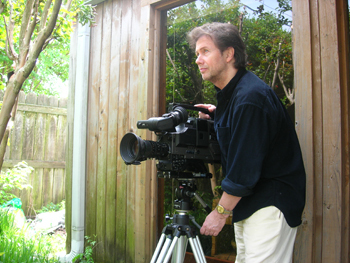 His last Memphis business, Robin Scott Studios, also was a video production company, one that employed the same techniques he's now trying to change. "I did it for about nine years, from the end of 1994 through 2003," Scott said. "In the interim, I was able to get away from the business and look at it from the outside in, and also to look to see what there was that was new." After regrouping, Scott found that technology had sprinted ahead. So he decided to run after it. "Really, when I left the business in 2003, there wasn't anything new to offer my clients. It's only been recently that all these interesting new things have come about, like the ability to affordably do high definition projects with a mobile editing setup. All these new things are interesting and are a way to offer my clients something that benefits them." "Really, when I left the business in 2003, there wasn't anything new to offer my clients," he said. "It's only been recently that all these interesting new things have come about, like the ability to affordably do high definition projects with a mobile editing setup. All these new things are interesting and are a way to offer my clients something that benefits them." By doing away with the physical studio and opting instead for a mobile shooting and editing unit, he's also doing away with the overhead involved in owning or renting an office space. In an older studio setting, putting a commercial together, for example, could be time consuming. First, it would require bringing clients to the studio for a shoot, followed by editing and presenting a finished product - with possible revisions. Now, all Scott and his contractors have to do is take a laptop computer, film on site and set up a few monitors. Then customers can participate in the process by giving feedback as the project unfolds. The editing software on the laptop is powerful enough that it allows Scott to bypass the old studio setting as needed. Add to that the fact that Scott uses outsourced labor and few permanent employees, and therein lies the formula that allows him to produce quality video at a low cost to consumers. All these ideas came to Scott while he was taking a break from the business. "During my hiatus, while I was out of the television and video production business, I remained an independent producer and was producing my own projects," he said. "I noticed that the software was getting cheaper and cheaper, certainly cheaper than it was when I started in 1994. "The computers themselves were more powerful, but they were less expensive, they ran better, they were faster, and the computers and software were much more stable," he said. So, since equipment was improving, Scott reasoned, why were customers paying the same or more for video production services? "From a business standpoint, I couldn't tell why the savings weren't being passed on to the client," he said. "And I began to realize that they could be. All you had to do was, now that we're at this juncture where everything is cheaper, faster and better, to utilize this better technology and pass the savings on to the client." Kasey Smothers, Scott's primary salesperson, pushes the same agenda. "We're coming to our clients with the best technology out there," Smothers said. "We go to their locations, we do it at a cheaper price, we're doing the best work possible; we're there to satisfy all their needs. Our main goal is to walk away with a satisfied client." And what kind of work do they do? Well, a little bit of everything. "We do broadcast-quality video - anything, whether you want to shoot a show, a pilot, or a commercial," Scott said. "We also do a lot of sales and training and promotional videos, and multimedia presentations that can be played back anywhere you have a screen." Robin Scott Enterprises also is looking toward the future of online video. "Let me also mention that there is a lot of video being produced on the Internet, and 2006 contains the front end of the video storm, I guess you could say, that is coming," Scott said. "It's just because broadband capability has reached the point where so many people have it, that video is starting to make sense for the Internet, and you're going to start seeing it more and more. "We'll design and produce videos that will play specifically for your Web site, however you need it done." All of this leads to Scott's vision for the future of video in Memphis. With the technology in place, it's his feeling that Memphis can look forward to a surge of activity in the entertainment industry, he said. "Memphis has a great opportunity to step up and be a big player in television, video and media production," he said. "I think this is a great time. Years ago, we couldn't have done it, because it was all centered in Hollywood, but it's not all done in Hollywood anymore. I think you're going to see more and more cameras and crews on the streets of Memphis before it's all over with," Scott said. With the economic and social benefits that sort of work brings, it's a goal with which most Memphians should be able to agree. Read our March 8 editorial page on the film production industry in Memphis at www.memphisdailynews.com and look for "No Incentives, No deal."